Review: Get Caught Up in "Tangled"
The folks at Disney understand that at the end of the day—or movie—a great villain can carry just about any movie. Luckily, “Tangled,” the Mouse’s new retelling of the story of Rapunzel, doesn't disappoint. So often films get mired down in setting up the backstory, but “Tangled” early on takes a misstep in the opposite direction, trying to gloss too quickly over how Rapunzel came to live with Mother Gothel and be imbued with her regenerative powers. Without giving too much away, How did Gothel know the words to that song? And what on Earth made folks think to look for such a plant? Seriously, these are gaping holes in both storytelling and logic. Once the story gets on track, we are treated to the first of the film’s musical numbers, “When Will My Life Begin?” a rather boring piece of pop puffery that is little more than a description of her dreary life. The fine art of being that up-tempo and simultaneously bleak is a tough trick that very few—Steely Dan comes to mind—can pull off. But both the stories and the songs get better as the film progresses. In this new version of the fable, Rapunzel’s special fella is not a prince, but a notorious thief who stumbles upon the legendary blonde upon while fleeing a caper. Then it’s time to get down to the serious business of escaping Gothel, reforming Flynn, falling in love and reuniting 'Punz with her biological parents. Screenwriter Dan Fogelman is to be commended for crafting a tale that is pro-female without being cloyingly girly or condescending. 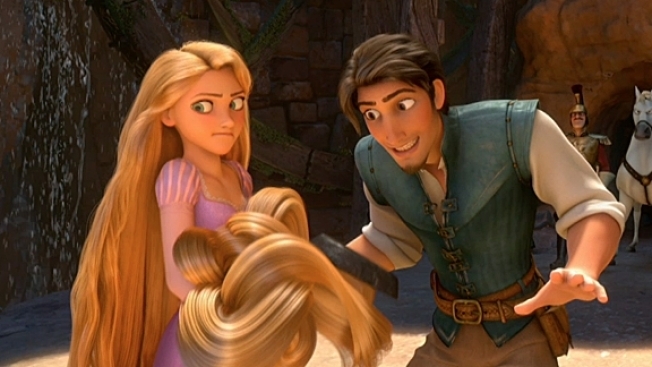 Rapunzel’s really no different from your average 18-year-old who desperately wants to leave home an discover the world--while dragging behind her a ridicullisly onerous head of hair. If there’s a lesson to be learned from “Tangled” it's that when casting voice talent for your animated feature, you’re far better off going for chops over names. Mandy Moore and Zach Levi are perfectly serviceable as Rapunzel and Flynn, but Broadway great Donna Murphy who outshines everyone them both. Murphy’s made a career of playing to the back of the room, she understands better than your average TV or film star that what can and should be done with one’s voice, not just while singing, but reading her lines as well. The film’s PG rating seems a bit harsh, but in light of the MPAA’s recent streak of prudishness and puritanical impulses, it shouldn’t be all that surprising. Most of what’s scary about the film is a product of the absurd volume prevalent in so many kids’ films. Our 2-year-old made it through doing far, far more dancing, clapping and bouncing than hiding of her eyes. “Tangled” isn't Disney at its best, but it will entertain all but the most cynical adults and sullen teens. The animation is gorgeous, of course, though we were a bit cheated by having only scene a 2-D screening of the film, which will be widely available in 3-D.